Wow has May been hec.tic. for me. We still have about 6 weeks to go, but the kids and I are definitely feeling the end of the year fever. The kids more so, I think it’s gonna be a long 6 weeks. Anyway, I have seen a picture or two floating around on Pinterest featuring Team Points. I’ve used team points since my first year of teaching, and I thought I’d share how it goes in my room. First let me say, I’ve done team points as a behavior management tool since my first year of teaching. It works so well, and is so easy to implement, that I don’t see myself ever NOT doing team points. I sit my kiddos in groups from the very first day of school. 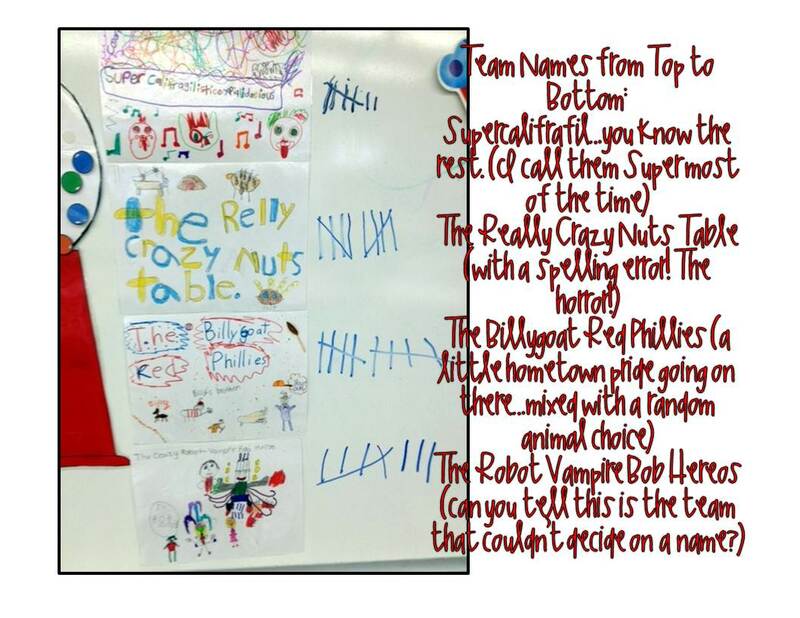 I usually do 4 groups, but I’ve done five and six, and also three super groups (about 7-8 kids per groups). I don’t find students to be more chatty in groups versus rows at all, and I don’t like the amount of space rows take up. I start them in groups from the beginning, which results in one less procedure to teach later in the year. 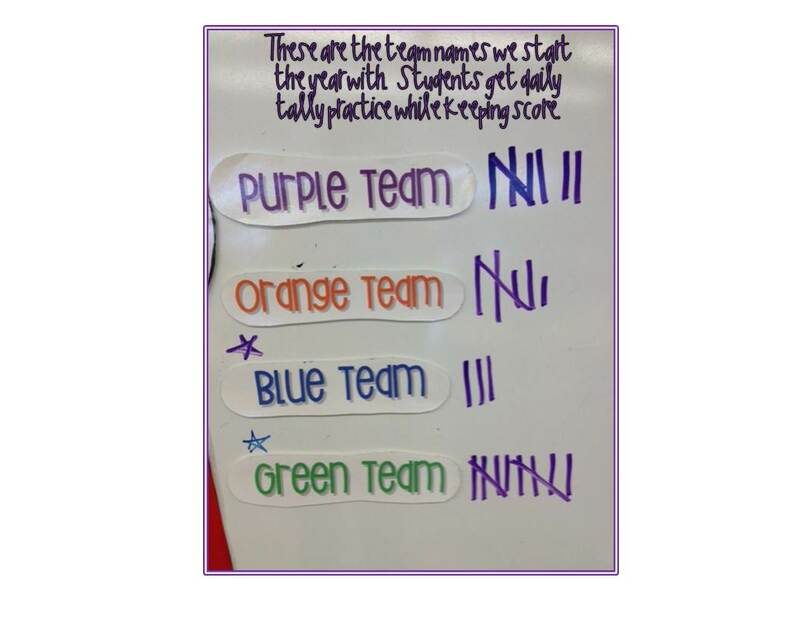 I assign each team a color name at the beginning of the year, but their names do change throughout the school-year. Their names often change with what we’re learning. We’ve had the Polar Team during habitats, the Verb team (after learning many parts of speeches), and the cube or cone team during geometry. However, the end of the year team names are best. I let them pick their own names. I don’t give them any rules, just that their name needs to be school appropriate, and everyone gets a say. 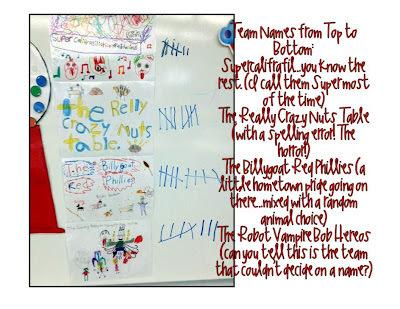 This year, three out of four of my groups decided quickly and unanimously. My fourth group just couldn’t compromise. So, I let them each contribute a word to their team name. And it turned out really strange…but they thought it was a riot. So even when the “naming ceremony” doesn’t work out… it works out! I use team points for many different reasons. One of the best ways I use points is to encourage speedy un-packing, clean-up, and preparation. Sometimes my kids dawdle. Like taking 8 minutes to tear out a workbook page dawdle. The minute I offer up team points for the first team to have their materials ready, it’s like I gave them a Red Bull IV. They can suddenly move at the speed of light! 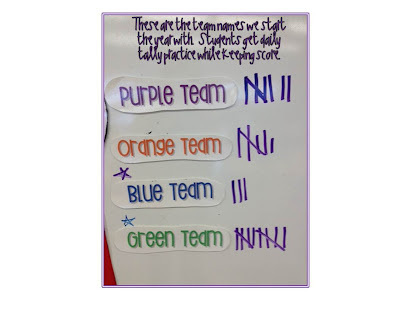 So, team points definitely help my classroom run more efficiently in that manner. I use team points for healthy competition. “I just love how the Purple Team is sitting up straight. I am going to give them 3 points”. Presto! Every student in my class suddenly has the posture of a finishing school student. If you really want your students to do something all you have to do is up the ante. I usually give 3 points for the 1st team who does what I ask, then 2, then 1. The last team sometimes will get a point as well, but not usually. When I really want them to do something really quickly, I say, “The first team who is ready gets 8 points!!!! !” These kids will move like they have never moved before. And what they don’t get is that it’s all pretty relative, because 2nd place will get 7 points and so on and so forth! The winning team gets a star at the end of the day. Once a team recieves 5 stars, they get lunch with me. In the eyes of a 2nd Grader, there is nothing better than that. Besides team points and team names, every team needs a captain. Team captains often record their team points on the board, or collect materials. The team captain title just rotates through the group in a clock-wise position. Each morning, there is a new team captain. At the beginning of the year, there was a lot of confusion over whose turn it was, so I made Team Captain signs that they keep on their pencil boxes, and hand off each morning. They're nothing too fancy, but they get the job done, and they get it done well! I strongly encourage using team points! Even at this point in the year, they’re still a saving grace of mine! Do you use team points, or something similar? Are you writing a comment? Yay! I love reading them! My Favorite Reads: Linking Up! Teacher Appreciation Sale & Arrays!! !